From responsive websites to mobile apps, we help our clients improve their customers digital shopping experience and improve their ROI. We manage every project, from websites and mobile apps to marketplace integration and B2B solutions, with the same careful attention to business strategy and a very different approach to break through the status quo. Our flexible, scalable, robust development and implementations are ideal for big-league thinkers who want to blaze new trails, improve performance, and shake things up a little along the way. We provide professional web portal development services. We are specialist in developing portal for Business, Community, Shopping , Job, Real estate and custom development. Our knowledge in the field of CMS Development is enormous with expert and skill full Web developers aiming at providing the best solution to customers. we offers a range of consulting services for optimizing your application performance and productivity. Our application performance and productivity (APP) experts work closely with application owners and domain specialists to make the most effective use of the high-performance computing (HPC) resources by enhancing code performance—often by an order of magnitude. 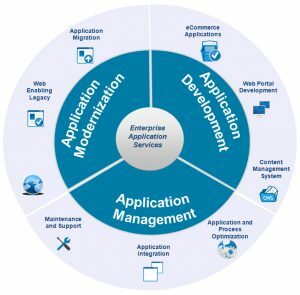 Enterprise Applications integration is the sharing of processes and data among different applications in an enterprise. For both small and large organizations. it has become a mission-critical priority to connect disparate applications and leverage application collaboration across the enterprise in order to improve overall business efficiency, enhance scalability, and reduce IT costs. Our EAI team has good level of experience in integrating SAP and other 3rd party applications. Our maintenance and support teams comprise highly skilled, experienced and multi-functional engineers led by managers responsible for complying with the agreed service level agreements (SLAs) and Computer’s quality standards. We approach maintenance and support projects both from a managerial and a technical point of view, aiming to create long term partnerships with our customers. EIPP has been assisting global corporations to transmigrate from legacy systems to systems that are built using emerging technologies and platforms. Application Migration is a specialized domain that demands in-depth functional knowledge and technical expertise. Whether it is an elementary migration or a multi-layered migration, we are geared up to assist your business with the transition process. Reuse and modernize your time-tested business applications to newer technologies and strategic platforms with EIPP Application Migration Services. We offer technology migration, database up-gradation, Web enabling and re-hosting. Our professional SEO consultants will help you to increase your Visibility in the Search Engines, Amplifying Qualified Traffic and Boosting Keyword Rankings. Our service includes Initial Website Consultation, Keyword Research, Meta Data Alterations, Review of and Implementation of Google Analytics/Google Webmaster Tools and Ranking / Status Reports. © Copyright 2019. EIPP Solutions Private Limited. All Rights Reserved.